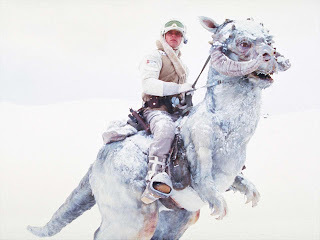 Best Fantasy and Science Fiction: Tauntaun Sleeping Bags - April Fool's Joke Turned Reality...Soon. 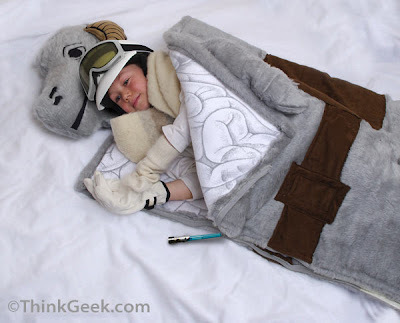 Tauntaun Sleeping Bags - April Fool's Joke Turned Reality...Soon. LA Weekly columnist Gendy Alimurung just wrote an excellent article about an April Fool's Joke gone terribly...right! For 2009 ThinkGeek.com had a slew of April Fool's Joke item listings including an Ultimate Assassin's Weapon Ice Mold, a USB Pet Rock, and of course the Tauntaun Sleeping Bag. Apparently the promise of a "Classic Star Wars sleeping bag (that) simulates the warmth of a Tauntaun carcass" is ideal for Star Wars fans and they weren't too happy it was not available! If it was good enough for Luke, I suppose its good enough for me and my kids! Which leads to this week. Shane Peterman, Think Geeks Public Relations manager, told LA Weekly that they are trying to obtain a license from Lucasfilms in order to actually produce the sleeping bag! They have no idea when this will occur, or if ever, it is all in the hands of Lucasfilms now to approve or deny the license so they can start production on a viable scale. What do you think? Would you want one? How much would you be willing to pay? Adult or children's sizes? Both? I know you want to sleep under the stars with children in tow, all enjoying a nice warm Tauntaun to sleep in! Check out the full article and interview details here.